Interestingly, Rohit Sharma also liked a tweet in which a Twitter user had questioned his exclusion from Test squad. 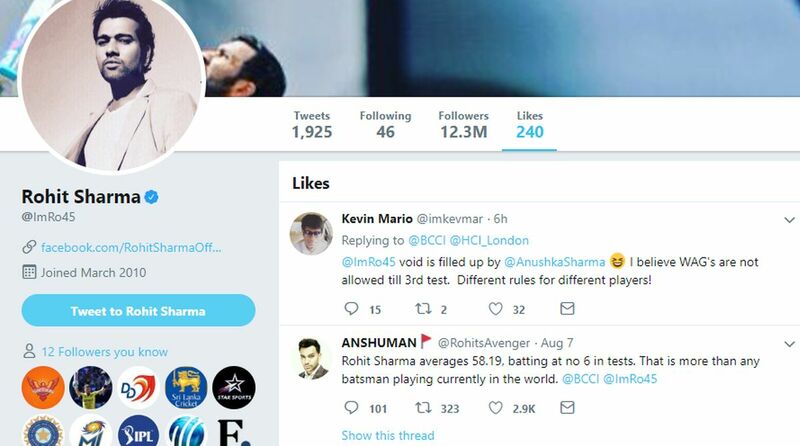 Star Indian batsman Rohit Sharma has raised many eyebrows after he liked a tweet by a Twitter user who pointed out how the Board of Control for Cricket in India (BCCI) had different rules for different players. Recently, Indian skipper Virat Kohli and his wife Anushka Sharma was trolled after she was photographed attending Team India’s official event while the families of other cricketers have reportedly been asked to stay away. 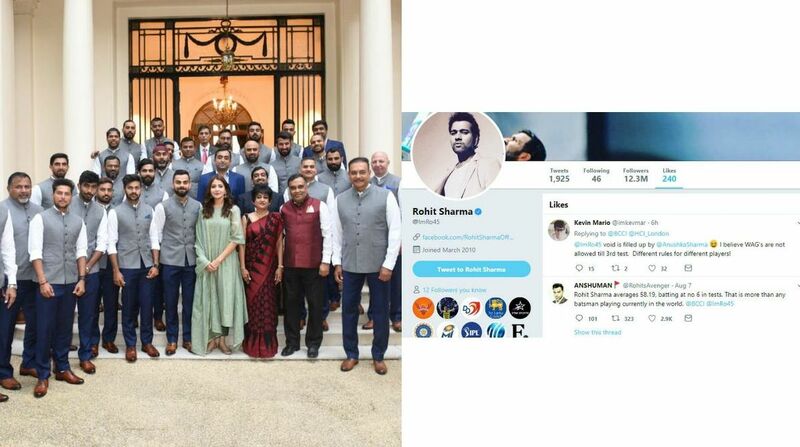 BCCI on Tuesday posted a picture of Team India from its official Twitter handle and the presence of Anushka Sharma in the photograph saw a lot of negative reactions from Twitterati. @ImRo45 void is filled up by @AnushkaSharma  I believe WAG’s are not allowed till 3rd test. Different rules for different players! What proof Rohit has that Virat dint take prior permission from BCCI. No different rules for different players there? Notably, before the start of India’s Test series, BCCI had confirmed that the WAGs (wife and girlfriends) of any the players would be given only 14 days to accompany their partners and that will be after the first three Tests. “Rohit Sharma averages 58.19, batting at no 6 in tests. That is more than any batsman playing currently in the world,” read the tweet that was liked by Rohit Sharma.